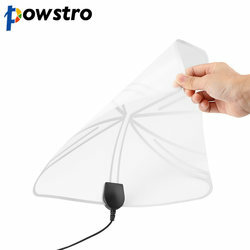 Home › TV Receivers › TV Antenna › powstro Flat HD TV ..
50 Miles long access range to far away broadcast towers, delivering full 1080p HD to any digital-ready TV. The amplifier boosts the TV antenna with better signal and butterfly pattern optimizes reception. Easy to set up, just unwrap, plug it in and scan channels, it allows you to place it anywhere and no power required.